I took my first pottery class at the UC Berkeley Studio in 1986 and have been throwing and building functional pots ever since. Over the years, I have found studios and firing opportunities near the places I’ve lived in both California and Texas. 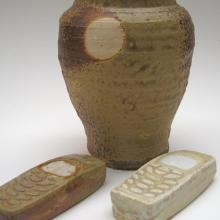 Some of the people I’ve met and studied with who have had strong influences on my work include Jeff Margolis, Kazuko Knappman, Richard Hotchkiss, Peter Wu, Nakona McDonald, Andrew Kontabeki, Linda Christianson and, of course, the other members of sfclayworks. My day job as a geologist also informs my work, as have the many trips I’ve made to Japan. I seek out native raw materials, such as clays from the Ione formation, natural wood ash and opportunities to participate in wood firings, when available. I mainly produce beverage containers, jars and vessels for displaying flowers, high fired in a reducing gas atmosphere. Thank you for your interest in my work.